You could head for the Casentino or more precisely, the National Park of the Casentino Forests, Monte Falterona, and Campigna. One of Tuscany’s three national parks, it was founded in 1993 and is just 50 kilometres east of Florence, high up in the Arno valley. To the east of the park there are the Camaldoli, La Verna and the Catenaia Alps mountain ranges, and to the west the Pratomagno massif. In the south, the River Arno begins on the slopes of Mount Falterona at Capo d’Arno, the mountain spring. At its heart is the Sasso Fratino Nature Reserve that was made Italy’s first Strict Nature Reserve in 1959 and now has UNESCO world heritage recognition, listed under “primeval forests of the Carpathian beech and other parts of Europe”. 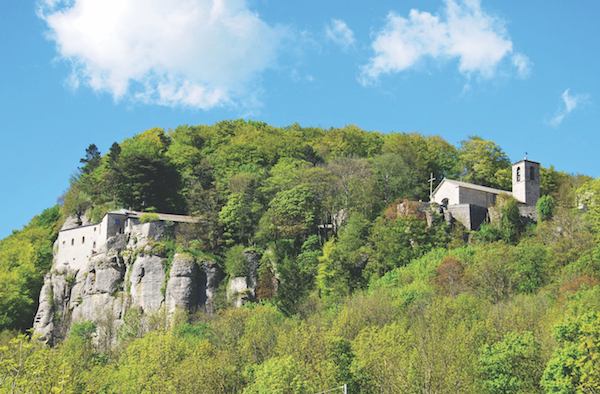 It’s home to a variety of wildlife including deer, roe deer, golden eagles, wolves and the spectacled salamander, and is a great place to walk, cycle or explore on horseback. It’s also home to several castles that were built by the Guidi counts of Poppi, one of the most important dynasties of central Italy that dominated large areas of Tuscany and Emilia-Romagna during the Medieval period until they were defeated by the Florentines at the Battle of Anghiari in 1440. 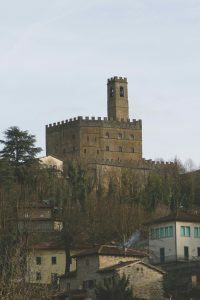 One of the most striking of these is the beautifully preserved castle that dominates the town of Poppi, attributed to Arnolfo di Cambio, who also designed the Palazzo Vecchio in Florence. Dante Alighieri lived here for a year during his exile from Florence and it is believed that it was here that he composed the 33rd canto of Inferno. 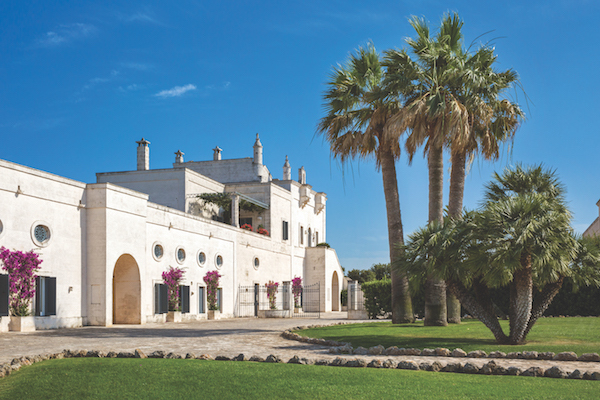 Casentino is a lesser-known area of Tuscany that has the power to attract and fascinate. It’s a place to take slowly, for walks through forests, visits to secluded monastic communities and meals of robust local food in relaxed mountain trattorie. Visit the Casentino and you’re visiting a mystical place of ancient beech forests, castles, monasteries and saints. It’s home to the Sanctuary of La Verna, where St Francis reputedly received the stigmata on the 14th of September 1224 at the Sanctuary of La Verna, and where the monks still live high up the mountain at the Camaldoli Heritage. Further north in the province of Forlì-Cesena in Romagna are the Acquacheta waterfalls that are quoted by Dante in his Comedy (Inferno Canto 16). Historically, it was also home to the Etruscans who inhabited much of Tuscany, Umbria and northern Lazio, and then went further north to Lombardy and Veneto, and south as far as Campania. Ruins can be found at Lago degli Idoli or lake of the idols beneath Mount Falterona that the Etruscans considered sacred near the spring – the Capo d’Arno – that is the beginning of the River Arno. It’s considered to be one of the most important archaeological sites in the Casentino. Excavation work began in 1838 and the remains found here are preserved both in the British Museum and the Louvre. 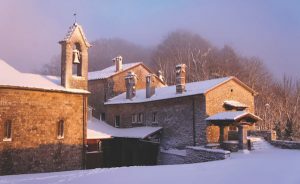 The Holy Hermitage and Monastery of Camaldoli is home to monks of the Camaldolese Benedictine order and was founded by a thousand years ago by St Romuald. The monastery itself is in the village of Camaldoli by the River Archiano. It dates back to 1046 and still has the old pharmacy where the monks continue to sell their products today. What used to be the original hospital where the monks treated the poor and ill is now a guesthouse. The Hermitage is a further three kilometres along in a remote part of the park in the middle of the forest, and you only have to go up there to see how the place fully embodies the Benedictine values of contemplation and isolation whilst still aligning it with the values of material work and charity. The people of the Casentino are proud of their food. This is the home of traditional bread-based Tuscan soups such as acquacotta or minestra di pane (thick minestrone made with stale bread) and scottiglia, also known as cacciucco di carne (a stew of various meats), the original cacciucco being that of fish and from Livorno. Alternatively, go for tortelli filled with potato, gnocchi with wild mushrooms, and grilled whole wild mushrooms, While you’re there, also try the local sambudello casentinese sausage made of pork, offal and wild fennel sausage. The area is renowned for chestnuts, and chestnut flour, used both in polenta and the castagnaccio cake that also includes pine nuts, walnuts, raisins and rosemary. Chestnuts are also boiled for a couple of hours and prepared with wild fennel and known as castagne tigliate. 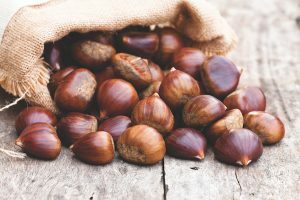 The Festa di Castagnatura is the local chestnut festival, which takes place for about three days around the time of Halloween in Ortignano Raggiolo. Obviously the sanctuary does get busy, and if you visit on a bank holiday you may not fully be able to appreciate the true atmosphere the place can convey. Wherever possible, do try to organise your schedule to ensure you can visit on any other day, especially if you have spiritual reasons for visiting. Otherwise, the Feast of the Stigmata is the sanctuary’s important religious festival that takes place on the 17th of September. It’s popular with pilgrims and especially with young people who take part in a special vigil that they hold the night before. The Feast of San Francesco takes place every 4th of October, the date of his death in 1226. He was made a saint two years later in July 1228. On the 18th of July 1939 Pope Pius XXII declared him the patron saint of Italy, “the most Italian of saints, and the most saintly of Italians”. And if you can, go in autumn, when the forests take on the most beautiful colours, and you can eat the last figs, and porcini mushrooms and hearty dishes with wild boar, hare, quail and pheasant. The Pilgrim’s Refectory opens all year and can seat 600 for lunch or dinner. If you wish to eat here, particularly during weekends or public holidays and other busy periods, you would be advised to book in advance. It’s plain home cooking, but worth booking in here if you’re planning to spend a day at the sanctuary. You can also book a longer stay. If you’re visiting Camaldoli, try the restaurant right opposite the monastery in the village. This is the oldest restaurant in the town and serves bar snacks such as the famous schiacciata (Tuscan focaccia) and cakes, or try something more substantial such as rich pasta dishes with game and meat dishes that include wild boar and local Chianina beef. 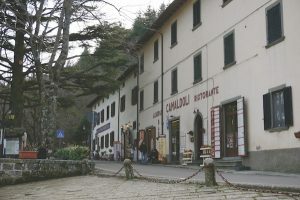 The Camaldoli is also a hotel with very decently priced rooms that include triple rooms and the option of adding an extra bed. Visit Parco Nazionale delle Foreste Casentinesi, Monte Falterona, Campigna for further information about the park, including visitor itineraries.